Are you ready to start stitching??! I'm so excited by the overwhelming response to the Kingfisher Stitch-along! Hurray! This week, Ange from A Little Patchwork is showing you how to baste your hexies, and I'm showing you some options for stitching. If this is your first or second time trying English Paper Piecing, there's one thing I want you to take from this - Play! My first EPP tries involved printable templates that I cut myself and thread basting which I found awkward and slow. It was only once I decided to play around with different methods of getting my pieces ready to stitch that I became hooked on EPP! I use Bohin Milliners Needles, size 9 (I have size 10 on hand too, but I prefer the 9s). Needle size number go UP, the SMALLER they are. So size 8 is wider and longer than size 11. I find size 9 goes smoothly through the fabric, has a hole big enough for my thread, and creates a hole in the fabric big enough that I don't have to yank it through. I've played around with a few different brands and have found these one don't bend or tarnish. I love them! For thread, I use Aurifil 50wt. Thread is one of those things that is definitely a matter of preference. Lots of people swear by Bottom Line thread. It's a 60 wt polyester thread. (Thread is another product where the numbers go up, the finer the thread.) I like cotton because I like the feel of it while I'm stitching. Polyester has a bit of a bounce which makes me queezy. But it tangles less. I always recommend trying what you have on hand first, and if it's frustrating you, spend a bit of money on new products. My favourite colour thread is 4651. It's a variegated cotton of lavender, lemon and cream, and blends beautifully with lots of different fabrics. There's also a nice variegated grey. I also end up using a lot of cream, mint or butter because it's what I have on hand. First off! 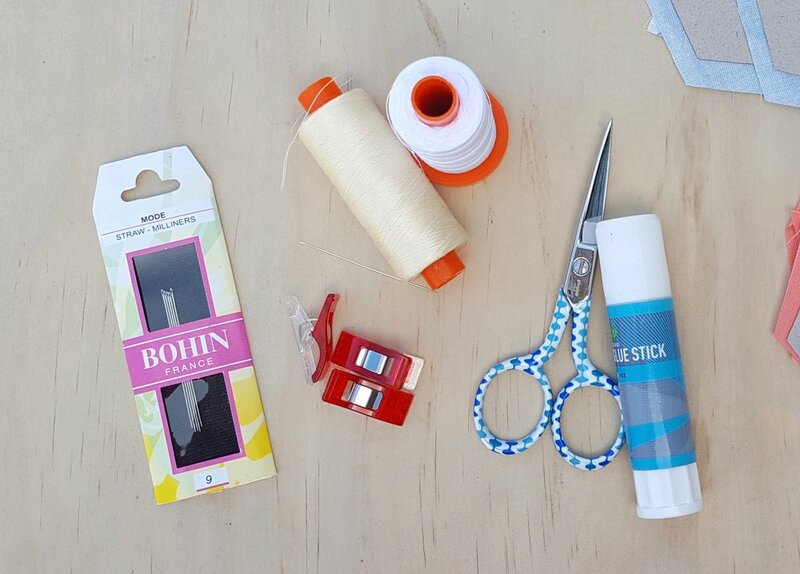 The absolutely essential thing that's going to keep you stitching happy with cotton is: Thread your needle with the end that has come off the spool first. If you like, thread you needle, and then snip the thread off the spool just so you can remember. Cotton thread is directional, and this little tip will save tons of tangles and thread breakages! I stitch away from myself and use my thumb nail to push the needle through the fabric. Lots of people stitch towards themselves or from one side to the other. Being a self-taught quilter makes me a little unconventional, but it works for me! 1. 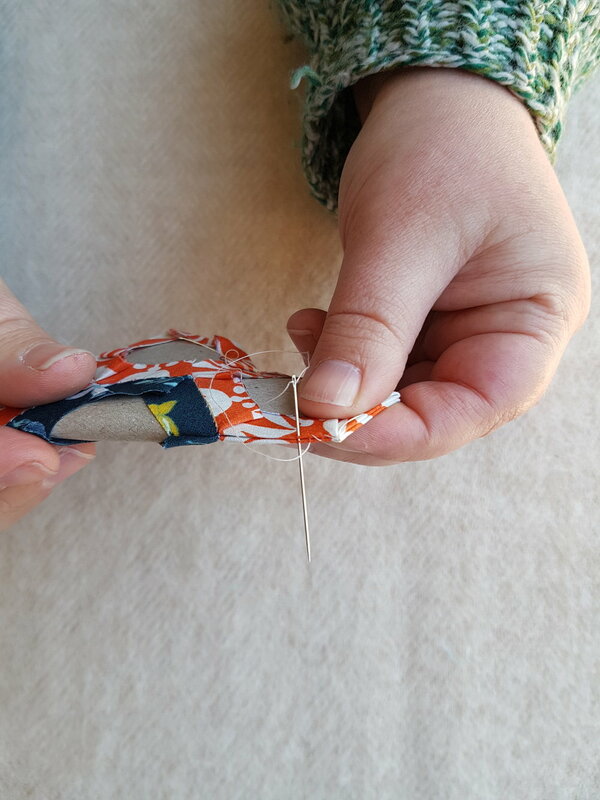 Making the Knot: Place the 2 pieced you wish to stitch together right sides together, and put the needle in through the corners of both pieces. Leave a little tail and hold it to the side. (I use my thumb that it holding the pieces together for this.) Stitch through the same section again and pull tight. Stitch again, and this time, put your needle through the thread loop before you pull tight. This makes your knot. 2. Whip-stitch along the seam until you come to a corner. Stitch a couple of times in the corner to anchor the stitch. If your seam ends here, knot as before. If you're joining the next piece, open out your hexies, and then place the next petal over the centre hexie, lining up the following seam and stitching a couple of times in the corner of both pieces. Continue joining pieces around the centre hexie. I've shared a video of me stitching today on Instagram if you'd like to watch me in action! If you hate seeing your stitches or want to try something different, you can learn how to Flat Back Stitch from Karen the DIY Addict here, or Invisible Feather Stitch here with Pat Bravo - both are great videos! Amira from A Little Mushroom Cap has also compiled a blog post here with different stitches, including a ladder stitch and Whip stitch comparison video from her. Also Mr Domestic has a great, clear video here on Whipstitching! I personally love seeing my stitches. Lots of practice has made them neat and regular, and I love that it shows off how handmade my quilts are! If you'd like a great, in-depth DVD about fussy cutting, basting, and stitching, I have a limited number of these Quilters Companion DVDs left in the shop! Or, I have super in-depth tutorials which include basting, stitching, and planning the construction of your EPP in EPP.101! Don't forget to share your progress on Instagram this week for a chance to win a Kingfisher Kit with fabric scraps, or a $75 gift voucher to the shop! And for all updates and links to blog posts, save the Kingfisher HQ page in your browser!